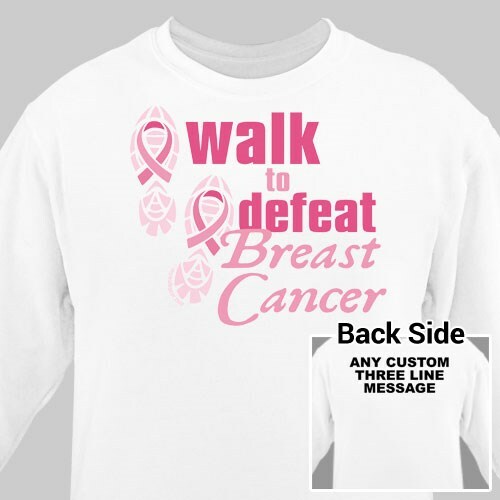 Support your loved one on every Breast Cancer Awareness Walk with your Personalized Walk To Defeat Breast Cancer Awareness Sweatshirt. Each Personalized Breast Cancer Sweatshirt proudly displays who you are walking for with loving compassion. Your unending support and commitment helps fight against Breast Cancer. Great quality. Good turn around time. I have received many positive comments on my sweatshirt when I wore it. MyWalkGear.com has many additional Personalized Breast Cancer Gifts for your special gift giving needs. Each time a gift is purchased from our Breast Cancer Awareness line of personalized gifts, MyWalkGear.com will make a donation of 15% of the purchase price to help in the fight against breast cancer. Be sure to also take a peek at our Walk to Defeat Key Chain and Personalized Walk to Defeat Hot Pink T-Shirt for any upcoming walk event you may be participating in.